Members of Yerevan City Council visited Georgia on within the project Lessons of Freedom: GEORGIA. The guests explored Georgian experience in terms of political freedom, fight against corruption, transparence and modern technologies. The visit was organized by the Europe-Georgia Institute with support of Friedrich Naumann Foundation for Freedom South Caucasus and Youth Delegate to the Congress of Local and Regional Authorities. Events of the first day took place at the Free University of Georgia, a private higher education institution founded by Kakha Bendukidze, a Georgian statesman, businessman and philanthropist. The guests had an opportunity to visit the facilities of the Free University, and shortly after the excursion Ms. Tamar Kovziridze hosted a meeting “Kakha Bendukidze`s liberal reforms: How did we succeed?”. Tamar Kovziridze is co-founder of Reformatics, affiliated scholar with the Free University of Brussels. She holds a Master’s degree in political science, economics and English philology from the University of Heidelberg, Germany and a Ph.D. from the Free University of Brussels, Belgium. Her research interests include trade policy, economic regulations, ethno-national conflicts, European Integration and federalism. In 2004-2012 Tamara Kovziridze held various senior positions in the Government of Georgia. She was Deputy Minister of Economy in 2004-2008, and Chief Adviser to the Prime Minister and Head of Advisory Group on Foreign Relations in 2009-2012. She participated in planning and implementation of various economic reforms in Georgia. She was Chief Negotiator in Georgian-Turkish negotiations on a free trade agreement in 2006-2007, Georgia’s Chief Negotiator for Russian accession to the World Trade Organization (WTO) in 2005-2011 and Chief Negotiator and coordinator of Georgian-EU negotiations on the Deep and Comprehensive Free Trade Agreement (DCFTA) in 2009-2012. Following the meeting with Ms. Kovziridze, Mr. Oto Nadiradze, Development Director of EGI spoke about current Political Situation in Georgia. Events of the second day took place at the Public Service Hall, AzRy Limited and at the Fabrika Hostel. First part of the day was spent at the Public Service Hall. We discussed successfully implemented technologies and reforms in Tbilisi. Guests visited the Public Services Hall, where the representatives from PSH gave insights about success of PSH and how modern technologies are making the life of citizens easier. Public Service Hall is an agency of the Georgian government which provides a variety of public services, these include the services of the Civil Registry Agency, the National Agency of Public Registry, the National Archives, the National Bureau of Enforcement and the Notary Chamber of Georgia. Services are made available at public service halls throughout the country. Currently, Public Service Hall endeavors to provide up to 400 services at the main location in Tbilisi. The guests also visited Azry Limited, which is the brainchild of several young Georgian entrepreneurs. Founded 14 years ago, the company started life as an outsourcing software development firm. But from the start the goal was to move the company into the custom IT integration business. Key to this course change was building and seasoning a stable, highly-trained and well-integrated team of IT professionals. Within a short time, the company was able to establish itself early-on as the “go-to” company for fully-supported IT solutions to very complex problems in both public and private sectors. This allowed the company’s growth to be entirely self-funded from internal sources and from sales income. Todays Azry continues to carefully expand its technical staff to be able to respond quickly to the particular needs of its clients. The objective is at all times to deliver premium-quality products on time, within budget and fully supported during installation, testing and evaluation. Azry is now offering its products and services outside Georgia. Azry’s “idea” has found a place in the highly competitive IT market. During second part of the day we have focused more on problematic issues in Tbilisi. Three main topics of the day were animal rights in Georgia, preservation of Cultural heritage and Urbanization of Tbilisi. The first lecture was hosted by Ms. Nino Chlaidze, the following one was held with Ms. Tamar Amashukeli, who discussed challenges and opportunities about the preservation of Cultural heritage. Mr. Sandro Saralidze hosted the third meeting “Urbanization of Tbilisi: Challenges and Achievements”. At the end of the day the guests visited Fabrika Hostel, which is the successful example of urbanization and modernization of old spaces for a modern city. Fabrika Hostel in Tbilisi, once a soviet sewing factory, that has been revived and transformed into a multi-functional urban space bringing together enthusiastic individuals ready to stretch their minds with new exhilarating experiences. Lost and forgotten in the historical part of Tbilisi, 8 E. Ninoshvili street, the former soviet sewing factory “Nino” is now the urban hotspot, for locals and travelers alike. With its striking “old-meets-new” attitude, the place oozes genuinely cool soviet vibes blended with funky industrial elements. Events of the third day, mainly the first part, took place at Sakrebulo, at the Tbilisi Mediathek and at the Presidential Palace of Georgia. Members of the Yerevan City Council had an informal meeting with the representatives of Tbilisi mayor’s office and Tbilisi Sakrebulo. They had an opportunity to exchange their experiences in terms of city development and reforms, Sakrebulo’s arrangement and the European Charter, which is a basis of Sakrebulos’s working principle. They also discussed control mechanisms and its effectivity. For the guests transportation and ecology issues were the most interesting discussion topics. During the meeting they emphasized regional relations, cooperation and the effort of NGOs in it. The next meeting was held at the Tbilisi Mediathek – a multimedia library chain which was established by Tbilisi city council. Mediathek includes reading halls, computer spaces and multimedia rooms. 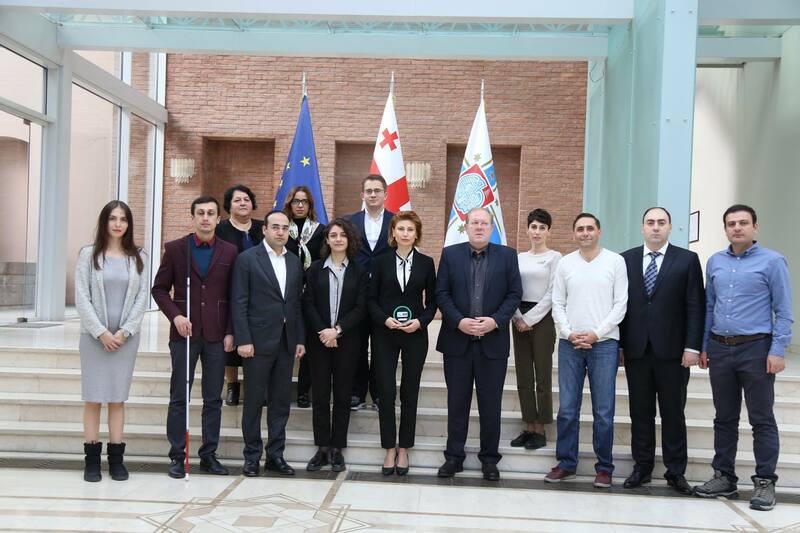 The members of Yerevan City Council were introduced to the idea of Tbilisi Mediathek, different types of projects that are implemented by the Tbilisi Mediathek, the experience and how it works in real life. The guests also visited the Presidential palace of Georgia as one of the symbols of statehood of modern Georgia. They were introduced to Presidential palace interior and administration management. The construction of the administration building commenced in 2004 on the basis of a 19th-century neoclassical edifice, which formerly housed the Imperial gendarmerie; the work was finalized in 2009. The final version was designed by an Italian architect Michele De Lucchi who had also designed the headquarters of the Ministry of Internal Affairs, The Bridge of Peace in Tbilisi and Medea hotel in Batumi. Façade of the Presidential Office appears in mosaic authored by Georgian designer Natalia Amirejibi de Pita with an aphorism from the medieval Georgian poem The Knight in the Panther’s Skin: “Good hath overcome ill; the essence of is lasting”. The largest element of the project are two shimmering “water mirrors”-28 long and 1,6 m high (89,6m2) mosaics in front of the complex main building called “Our background and our identity” encapsulating the entirety of Georgia’s complicated and colourful history accomplished by Natalia Amirejibi de Pita. The dome of the building, constructed out of three-dimensional bent glass in Germany, was designed by a Georgian architect Vakhtang Zesashvili and Italian Architect Franc Zagari. In front of the administration building, facing the main entrance stands a rotating monument in three colors, designed by Ambassador of Georgia to Germany and granddaughter of last Emperor of Austria Charles I of Austria, Gabriela von Habsburg, representing three branches of government – legislative, executive and judicial. Second part of the day included UrbanLab. UrbanLab is a youth think-tank on Urban Issues of Tbilisi created during the visit of FDP Torsten Herbst to Georgia with support of Naumann Foundation. The guests had an opportunity to discuss with the members of UrbanLab how they see the future development of Tbilisi and local governance. The discussion was mainly on local elections and the opportunities for youth to participate in local governance. The lecture was about Tbilisi, its local and international function through centuries, how it developed as an international multicultural crossroad city through history. The lecturer Aleksandre Elisashvili, a historian and a civic activist on Urban issues. One of the founders of “Tiflis Hamqar” organizations which was one of the most active group on Tbilisi issues through last 10 years. Also an ex-member of city council and an independent candidate on Elections of Mayor of Tbilisi. Events of the fourth day took place in Mtskheta – historic city in Georgia which is UNESCO world heritage site. Historical Monuments of Mtskheta were placed by UNESCO under Enhanced Protection. Therefore Mtskheta developed as a touristic town for local and international tourists. Visitors had an opportunity to discuss the experience and future development of Mtskheta with local government officials and the Deputy Mayor of Mtskheta.